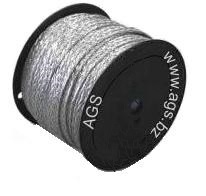 GENERAL SPECIFICATIONS: a specific number of ends of wire, braided with a specific number of carriers (strands) which is subsequently mill-rolled for specific width and thickness. Percentage Plating- The quantity of plating on a conductor express as percentage by weight. The term is misleading 2.5% plating on an AWG 40 is 16 microinches thick, while 2.5% plating in a AWG 30 is 53 microinches think. All Tinned Copper Tubular Braids are made with the individual ends of wire that conform to the ASTM-B 33 specification. GENERAL USES: As required by Allied Mil-specs and other industrial specifications. Contact us for special constructions not listed. * Current Carrying Capacity (AMPS) is aprox. 30% of Copper Braids with same construction. General Specifications: Formed to maintain 85% shielding coverage over nominal diameters 1/8 inch and larger. 70% minimum on sizes smaller than 1/8 inch. Minimum Orders: 250/500/1000 FT. Per Type. Some Braids have a 500 foot minimum. Divison on American Grounding Systems, Inc.